Floor heating as a primary heat source? WarmlyYours TempZone™ Floor Heating systems can be an effective primary heat source. However this effectiveness can vary given such variables as climate, insulation and position of the room that you want to heat in your home. 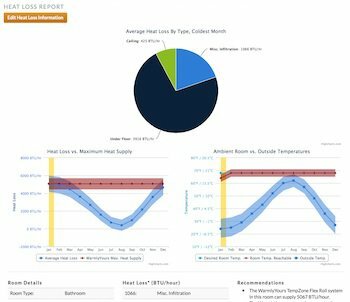 This innovative online tool can help you determine if the room you would like to heat is a good candidate. Click the button below to find out whether WarmlyYours TempZone™ can be used as the primary source of heat in your room, create a new project/room and select the Heat Loss Calculation option after you see your instant quote options. Please note that to use the Heat Loss Calculator you’ll be asked to create a WarmlyYours account—this will help us provide greater specificity in your Heat Loss Calculation and it will also be easier to make changes to future projects we work on together. When setting the temperature of your floor heating system, ensure compliance with the floor covering manufacturer's required maximum temperature limit, if applicable to your floor covering type. Due to some flooring manufacturer's maximum temperature limitations, some floor covering types may not serve as an optimal choice for a primary/sole heating source.